Listed bellow are all our popular disc sizes that are normally kept on the shelf, if yours isn't there then we can still help as we keep large stocks of blank castings on the shelf ready to cnc machine to your requirements. Our range currently goes from 285 to 375mm in diameter and 20 to 36mm in width so it doesn't matter whether your original rotors were made by AP, Brembo, K Sport, Alcon, Hi Spec etc we can make to measure! Available with plain, curved grooves, J hook or straight grooves (custom groove types also available). Any number of fixing holes or pcds. Call or email us with the original disc or kit part number or with the dimensions shown on the image (click on to make larger) together with disc width and we will do the rest. Pair of replacement 295x25mm brake disc rotors. These can also be used to replace AP Racing, HiSpec and several others. . Available with plain, curved grooves, J hook or straight grooves. 12 x 1/4" holes with a 177.8 (7") pcd (other pcds available, just ask). We recommend you use a new AP Racing bolt set (extra £18 per disc). Please note that it's extremely important that A) the correct bolts are used to secure disc to bell and B) those bolts are tightened to exactly 10.5ft/lb or 14nm. If you don't have the correct calibrated torque-wrench for the job, just send us your bells and we will mount the rotors for you. Pair of replacement 295x28mm brake disc rotors. These can also be used to replace AP Racing, HiSpec and several others. .
12 x 1/4" holes with a 177.8 (7") pcd or 190.5 (7.5") other pcds and amount of fixing holes available, just ask. Pair of replacement 300x28mm brake disc rotors. These can also be used to replace AP Racing, HiSpec and several others. .
12 x 1/4" holes with 177.8 (7") pcd, other pcds and amount of fixing holes available to order, just ask. Pair of replacement 304x28mm brake disc rotors. These can also be used to replace AP Racing, HiSpec and several others. .
12 x 1/4" holes with 177.8 (7") or 190.5 (7.5") pcd, other pcds and amount of fixing holes available, just ask. Pair of replacement 304x29mm brake disc rotors. These can also be used to replace AP Racing, HiSpec and several others. . Pair of replacement 308x25mm brake disc rotors. These can also be used to replace AP Racing, HiSpec and several others. .
12 x 1/4" holes with a 177.8 (7"), 190.5 (7.5") or 203.2 (8") pcd, other pcds and amount of fixing holes available, just ask. Pair of replacement 310x28mm brake disc rotors. 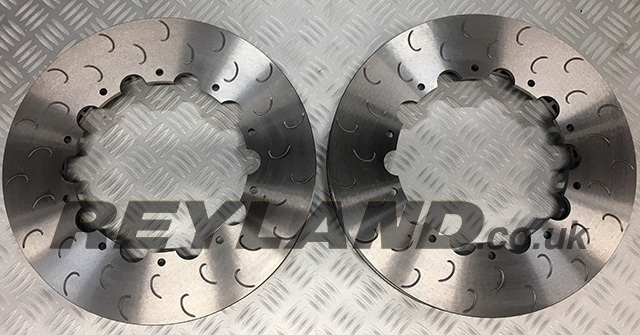 These can also be used to replace AP Racing, HiSpec and several others. .
12 x 1/4" holes with a 177.8 (7") ,190.5 (7.5") or 203.2mm (8") pcd other pcds and amount of fixing holes available, just ask. Pair of replacement 315x28mm brake disc rotors. These can also be used to replace AP Racing, HiSpec and several others. . Pair of replacement 320x28mm brake disc rotors. These can also be used to replace AP Racing, HiSpec and several others. .
12 x 1/4" holes with a 190.5 (7.5") or 203.2mm (8") pcd other pcds and amount of fixing holes available, just ask. Pair of replacement 325x28mm brake disc rotors. These can also be used to replace AP Racing, HiSpec and several others. Weight 6.4kg per rotor. 12 x 1/4" holes with a 190.5 (7.5") or 203.2 (8") pcd other pcds and amount of fixing holes available, just ask. Pair of replacement 324x30mm brake disc rotors. These can also be used to replace HiSpec 325x30mm, Compbrake 325x30mm and several others. Available with plain, curved grooves or straight grooves. 12 x 1/4" holes with a 203.2 (8") pcd (other pcds and amount of fixing holes available, just ask). Pair of replacement 330x26mm brake disc rotors. 12 x 1/4" holes with a 203.2 (8") pcd other pcds and amount of fixing holes available, just ask. Pair of replacement 330x28mm brake disc rotors. These can also be used to replace AP Racing 330x28mm, HiSpec 332x28mm, Compbrake 330x28mm discs and several others. Weight 6.6kg per rotor. 12 x 1/4" holes with a 190.5mm (7.5") or 203.2 (8") pcd other pcds and amount of fixing holes available, just ask. 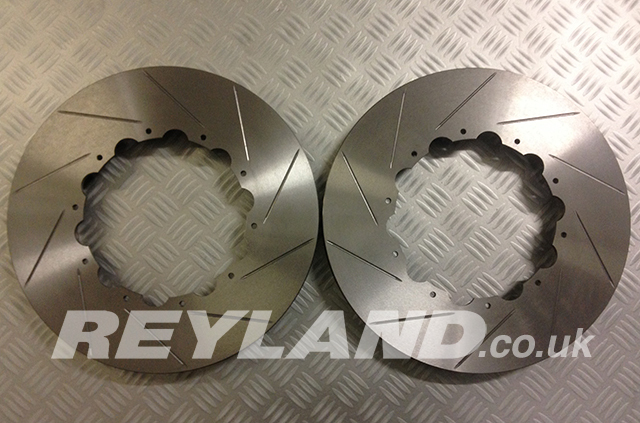 Pair of replacement Reyland 330x30mm brake disc rotors. These can also be used to replace AP Racing, HiSpec, Compbrake discs and several others. 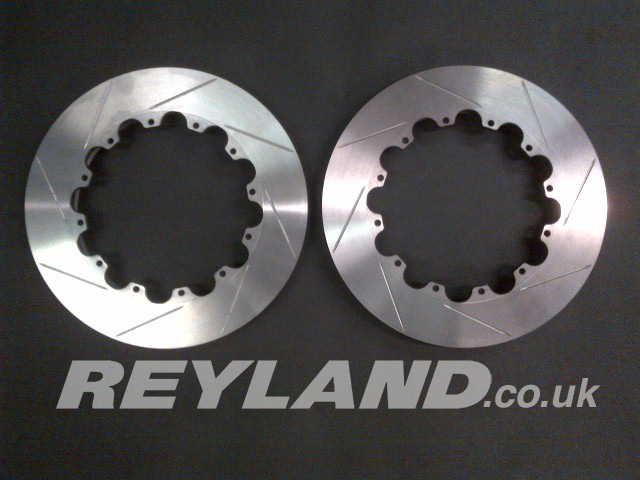 Pair of replacement Reyland 330x32mm brake disc rotors. These can also be used to replace AP Racing 330x32mm, HiSpec 332x32mm, Compbrake 332x22mm discs and several others. If you're using AP Racing CP5200 calipers and AP Racing 330mm discs, we can supply a set of caliper shims (shown above) to enable the swap from 330x28mm AP discs to our 332x32mm discs. 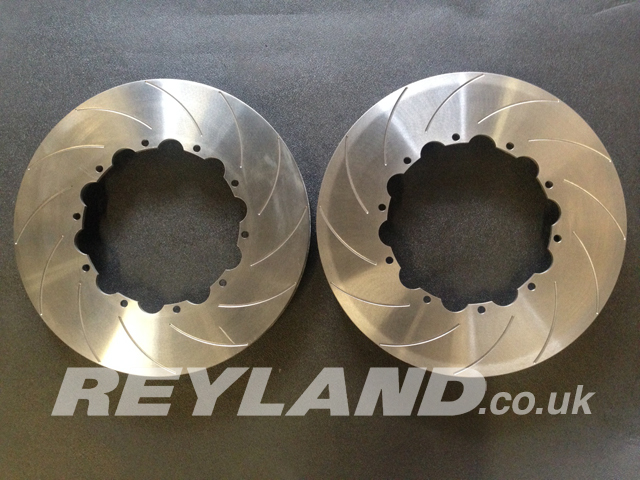 Pair of replacement Reyland 335x30mm brake disc rotors. Precision ground faces. As found on Astra 888 models (and others). 12 x 1/4" holes with a 214mm pcd. Other pcds and amount of fixing holes available, just ask. 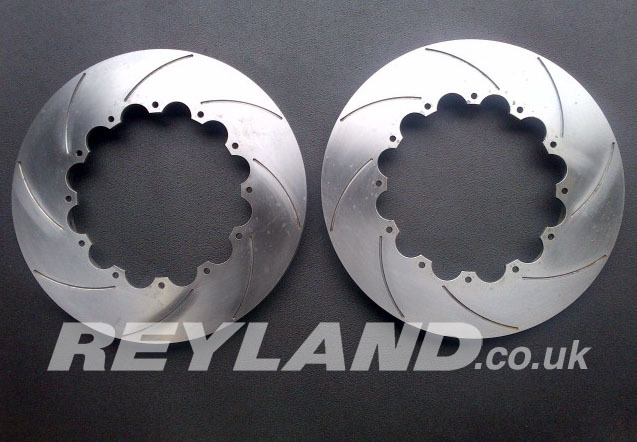 Pair of replacement Reyland 343x28mm brake disc rotors. Precision ground faces. Available with plain, curved, straight or J hook grooves. 12 x 1/4" holes with a 215.9 (8.5") and 228.6 (9")pcds. Other pcds and amount of fixing holes available, just ask. 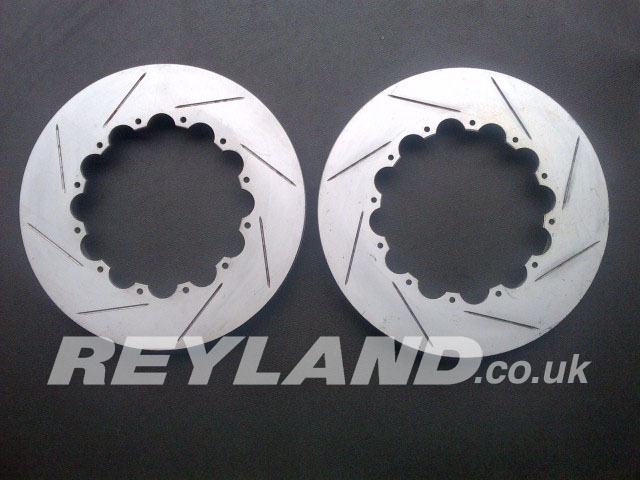 Pair of replacement Reyland 343x30mm brake disc rotors. Precision ground faces. 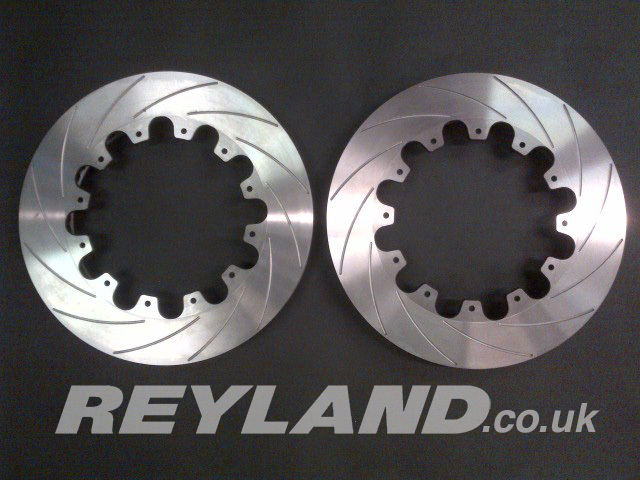 Pair of replacement Reyland 343x32mm brake disc rotors. Precision ground faces. 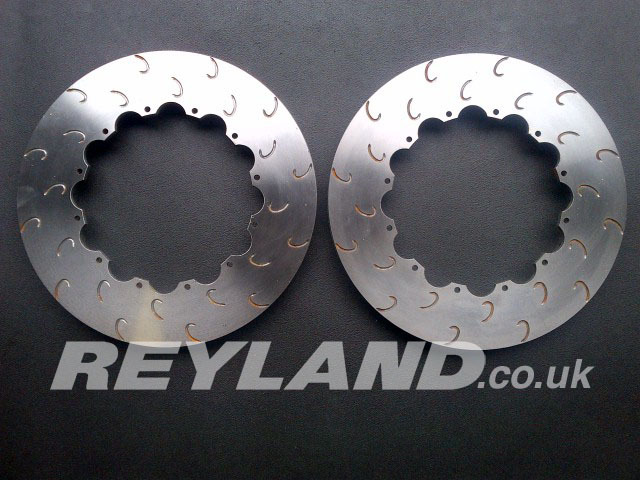 Pair of replacement Reyland 350x28mm brake disc rotors. Precision ground faces. 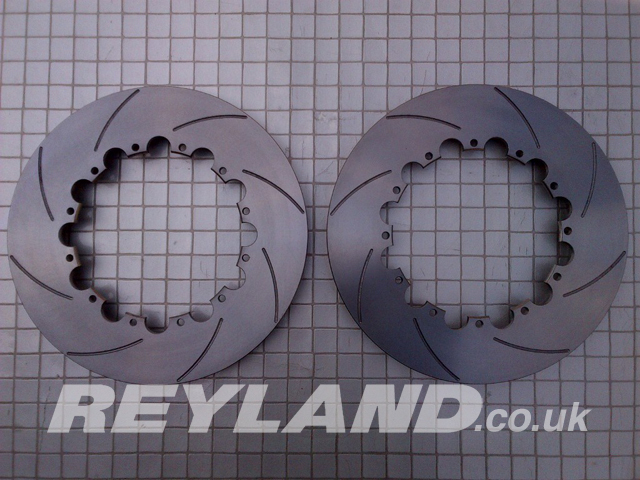 Pair of replacement Reyland 350x30mm brake disc rotors. Precision ground faces. Available with plain, curved, J hook or straight grooves. 12 x 1/4" holes with a 215.9 (8.5") and 228.6 (9") pcd other pcds and amount of fixing holes available, just ask. Pair of replacement 355x32mm brake disc rotors. These can also be used to replace AP Racing 355x32mm discs and several others. 12 x 1/4" holes with a 215.9mm (8.5") or 228.6mm (9") pcd other pcds and amount of fixing holes available, just ask. Pair of replacement 355x32mm brake disc rotors. These are designed to replace the OE rotor fitted to Insignia & Astra VXR models that were originally equipped with 4 pot Brembo front brakes. Straight swap for the original discs. Pair of replacement 356x32mm brake disc rotors. These can also be used to replace AP Racing 356x32mm discs and several others. Pair of replacement 360x32mm brake disc rotors. These can also be used to replace ECS tuning discs and several others. 10 x 9mm" holes with a 206mm pcd other pcds and amount of fixing holes available, just ask. Pair of replacement 362x32mm brake disc rotors. These can also be used to replace AP Racing 362x32mm discs and several others. Stocked in D55 and D61 pad depths but we can custom machine other depths, mounting pcd's and amount of fixings. Stocked in 12 x 1/4" holes with a 215.9 (8.5") pcd or 228.6 (9") other pcds and amount of fixing holes available, just ask. Pair of replacement 362x32mm brake disc rotors. These can also be used to replace AP Racing 362x32mm discs and several others. Stocked in D55 and D61 pad depths but we can custom machine other depths, mounting pcd's and amount of fixings. Available in 34mm and 36mm widths too, POA. 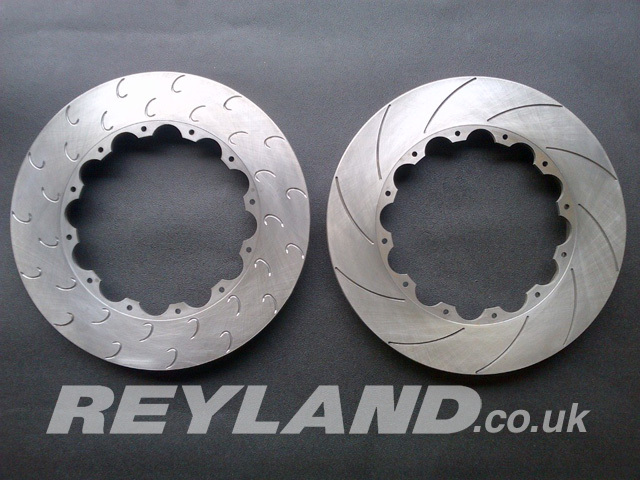 Pair of replacement Reyland 365x32mm brake disc rotors. These can be used to replace Alcon DIV2175X576C24 365x32mm discs and several others. Other 365mm rotors available in a wide range of PCD's, just ask. Stocked in 12 x 1/4" holes with a 228.6 (9") and 240mm pcd other pcds and amount of fixing holes available, just ask. Stocked in 12 x 1/4" holes with a 240mm pcd other pcds and amount of fixing holes available, just ask. Pair of replacement AP Racing 330x28mm bolted brake disc rotors. We can also supply 32mm width and also floating mount, just ask. 12 x 1/4" holes with a 203.2 (8") pcd. Pair of replacement AP Racing 355x32mm bolted brake disc rotors. Available with curved grooves..
12 x 1/4" holes with a 215.9 (8.5") pcd, other pcd's and floating mounting available, just ask. Pair of replacement AP Racing 362x32mm bolted brake disc rotors. Available with curved grooves. 12 x 1/4" holes with a 215.9 (8.5") pcd, available in pad depths of 54 and 61mm. We can supply alternative pcds and also floating mount, please ask. 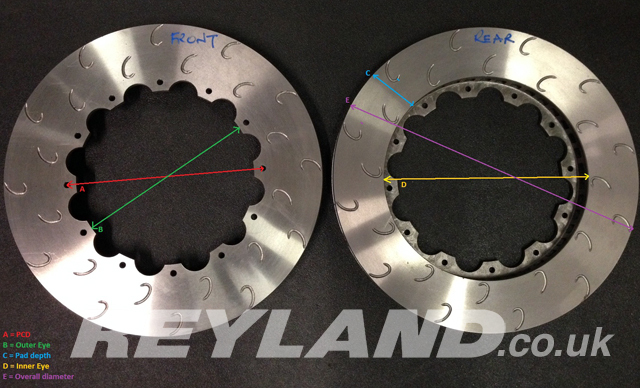 Other sizes of Reyland and AP Racing discs available at very competitive prices. Please call if you don't see what you're looking for.